It’s been an exciting time for Raghu Dixit! A few weeks back, he performed live in front of The Queen at Windsor Castle, singing his song “Mysore Se Ayi” surrounded by a troupe of dancers from Bangalore, the dance company owned and choreographed by Raghu’s wife, Mayuri Upadhya. This Sunday, ITV will broadcast this spectacular pageant, “All the Queen’s Horses: A Diamond Jubilee Special” from 6:30pm to 8:30pm. The show features horses and performers from around the world, including the New South Wales Mounted Police and the Marwari Horses of India, Dame Helen Mirren, Rolf Harris, Omid Djalili, Sanjeev Bhaskar and live music from Susan Boyle, Joss Stone, Il Divo and violinist David Garrett. Rare archive footage of the Queen during her sixty-year reign will also be shown. 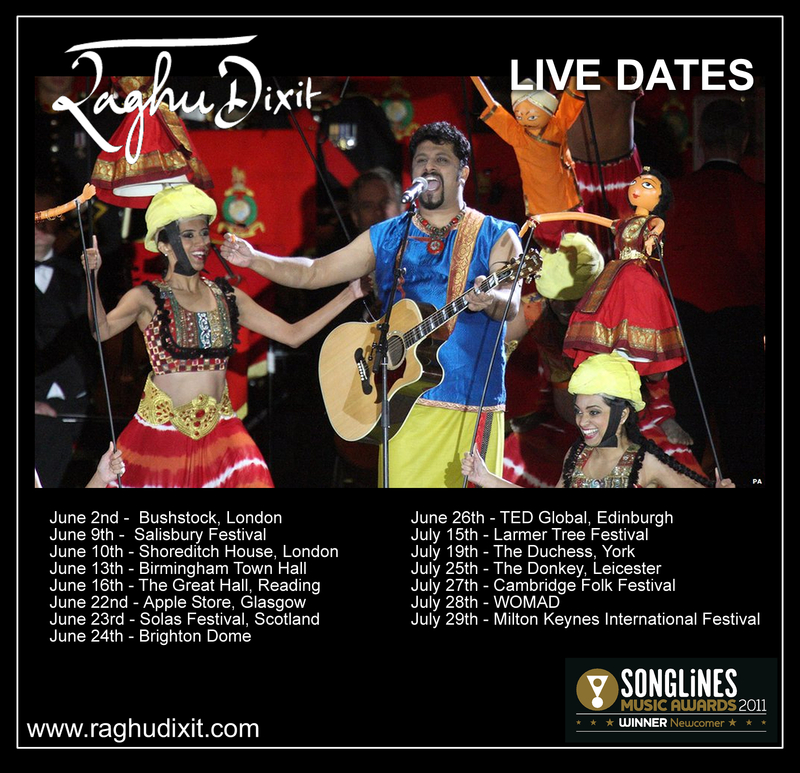 Raghu has just played his first concerts in Europe (Holland and Germany) and now embarks on a summer run of UK festivals. More live dates can be found in the flyer below. Raghu was also selected by Thomas Dolby to be one of the 3 artists to perform at the upcoming TED Global in Edinburgh, on 26th June. More information on this prestigious event can be found here. Listen to Raghu’s love song, “No Man Will Ever Love You Like I Do” here. Hope you all have a great Diamond Jubilee weekend!